An Inspirational Pattern: Blog about a pattern or project which you aspire to. Whether it happens to be because the skills needed are ones which you have not yet acquired, or just because it seems like a huge undertaking of time and dedication, most people feel they still have something to aspire to in their craft. If you don’t feel like you have any left of the mountain of learning yet to climb, say so! 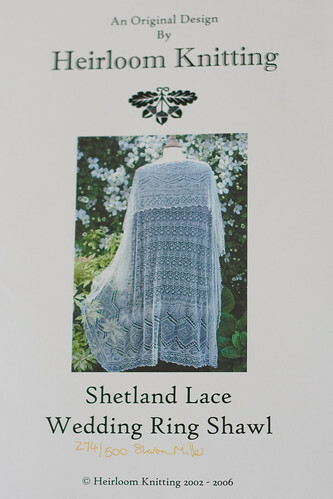 For knitters wanting the challenge and satisfaction of a high-end project, HK has created the Wedding Ring Shawl – a true reflection of Shetland Lace’s heritage. This project for the ultra-skilled knitter requires time, concentration and patience but in the end, all efforts will be rewarded by the finished shawl – a delicate webby patterning of geometric lace motifs, large and small. The pattern comes with a Yarn Samples Card giving a selection of working lengths of possible yarns. Knitters are strongly advised not to purchase any yarn for this project until they have thoroughly swatched and evaluated the effects that using these different (or alternatively chosen) yarns may produce. I knew that one day I wanted to be “good enough” to knit this shawl. I had been knitting for 2 years, but hadn’t ventured into lace yet. There were 500 signed limited edition patterns to be sold, which included cobweb yarn to swatch with. Given that it was limited edition, I knew I had to get my hands on this pattern or I may never have the chance to. (Their Ravelry page says that it is supposed to be available again this year and from the posts on Ravelry, it was available earlier this month. Not sure if there will be more copies since their website is currently offline.) I bought it immediately and it wasn’t cheap by any means with the Euro to US Dollar conversion. I think it was around $45 for the pattern. Now, back when I was a new knitter, that was a LOT of money for a pattern since I had been knitting mostly from free patterns, acrylic yarn, and very cheap wool. When I got it, though, I didn’t regret the money I’d spent. It’s a very detailed pattern and even then (when I knew less as a knitter and what went in to such a pattern) was worth the cost. Since it arrived back then, I have kept it in the original package it arrived to me in. I have taken it out of the plastic it came in twice in the 5 or so years I’ve had it. Every time I look at this shawl, I am in awe of it, even now after I’ve been knitting for 6 years and lace no longer frightens me. Not that it ever really did, but lace of this size? Yeah, it scares me just a bit! I think that I have the skills needed as a knitter to knit this. I even think that if I started it, I could finish it and it would be lovely. This Wedding Ring Shawl is my Everest as a knitter. It’s the huge, time consuming project that I want to be able to say I have done and be able to show off some day. This is the project I aspire to knit some day because of the massive undertaking I feel that it is. I’ve never knit with cobweb lace or a lace shawl of this size. The combination of the two is a bit frightening, but someday, I’d really love to complete this. Be sure to check out the other entries for today’s topic! Secondly, I have no doubt in my mind that you have the skills to do this lace shawl. I guess the commitment is the intimidating part, and I can’t quite blame you! Go for it!! It is so beautiful, and remember it is all just one stitch at a time!! !